Welcome to day six of my Sneak Peek Week! I must say, this week has kept me quite busy! 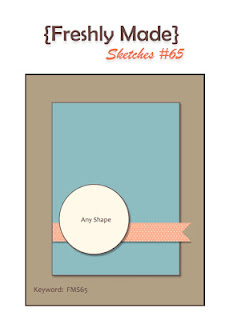 But I have been having a fabulous time trying out all my new goodies from the Stampin' Up Spring Catalog. 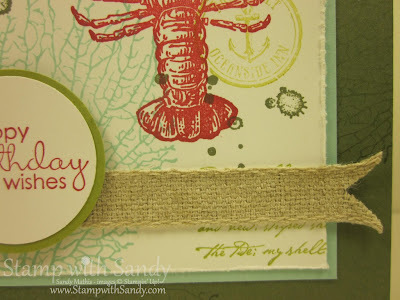 Today I thought I'd feature something a little more masculine, so I decided on my new favorite for masculine projects, the By the Tide Stamp Set. 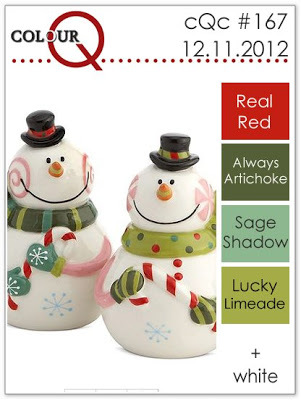 The color scheme was provided by the ColorQ Challenge for this week. The colors are perfect for a holiday card, but I thought I'd go a different way with them. As it turns out, they are also perfect for a nautically inspired card. I didn't have Sage Shadow, though, so I substituted the closest color I had, Pool Party. I hope it will do! I knew I wanted to stamp collage-style, and the layout from Freshly Made Sketches was just perfect. The large field gave me plenty of room to spread around all the cool images from my new stamp set. 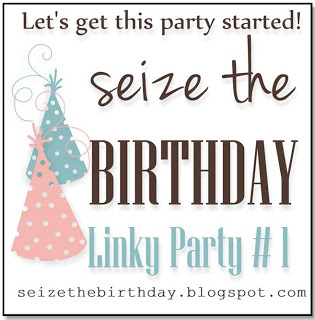 Lesley Croghan has a fun new blog challenge called Seize the Birthday, and this first challenge is a Linky Party. What fun! 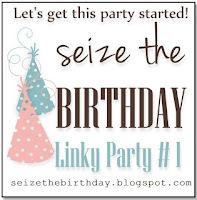 I have around ten birthday cards to make for January so I may be a frequent flyer for a while! I realize that since my lobster is bright red, it indicates he's been cooked and no longer swimming around with the other fishies. 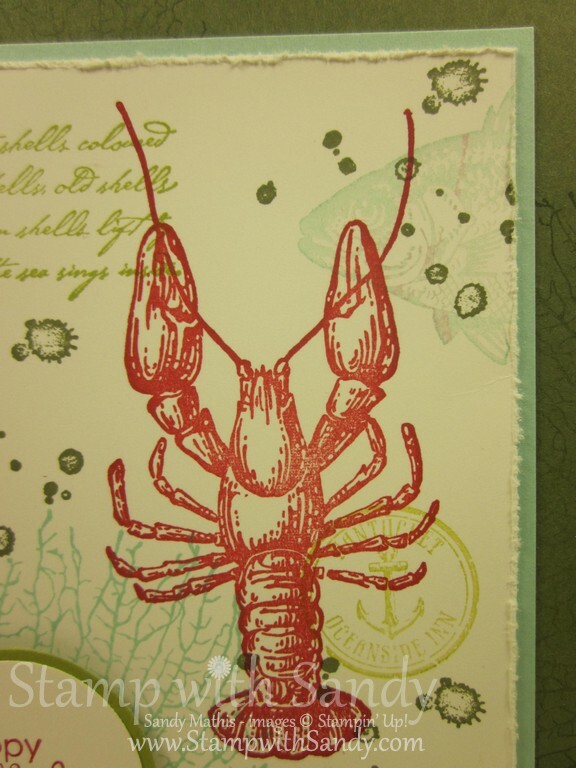 However, I was aiming for a masculine card and the task of cooking lobster is delegated to the men in my house as the process makes me squeamish. That's how I thought this through. Scary, huh? The base of the card is Always Artichoke. I stamped images in the same color, stamped off once, for a subtle background. 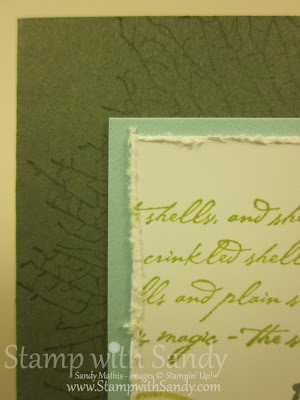 You'll see that the main panel is distressed on the edges, and that was accomplished with the new Stampin' Distress Tool. Love it! Now I can put the steak knife away, much to the relief of my hubby. I think what goes on in my crafty space frightens him sometimes! 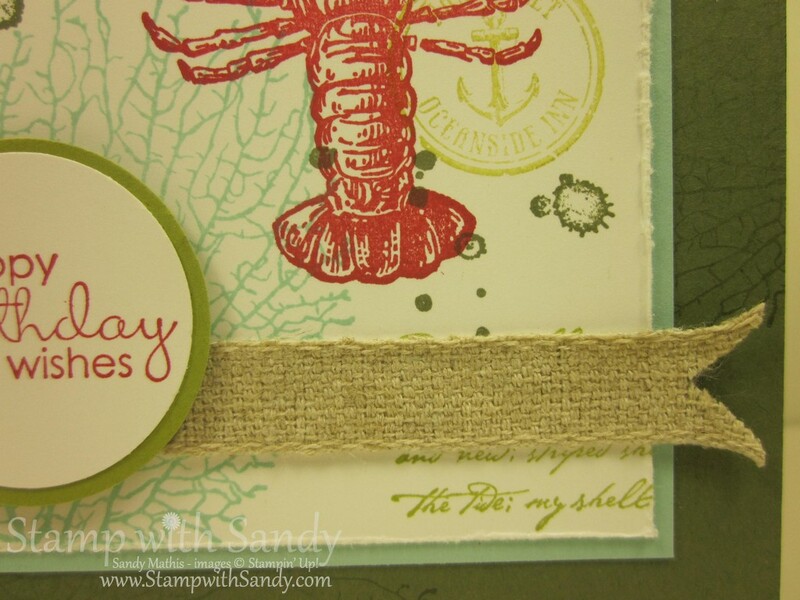 A little piece of Natural Trim Ribbon is in keeping with the sketch challenge and adds a little texture. The last day of Sneak Peek Week is tomorrow; don't miss it! Wow!! What a great 'male' card...I find them hard to make but the birthday blog will make sure we don't have a shortage of them. ooohh...I love it...awesome stamping and colors! Love the colors and all the little details of this one! I love this! Now I need to see your other sneak peeks! A collage is a great way to use these stamps! Great masculine card! Thanks for joining us at Freshly Made Sketches and colourQ! OK, I had to laugh about the bright red lobster :) Every lobster souvenir available here on the east coast of Canada is red, and I always wonder if people KNOW that when they buy them! Oh, I just knew that I was going to like this set! Great card! Glad you joined us this week at FMS! Ha! I love your "though process" on making this! Great card--and now I know I MUST have that distress tool! 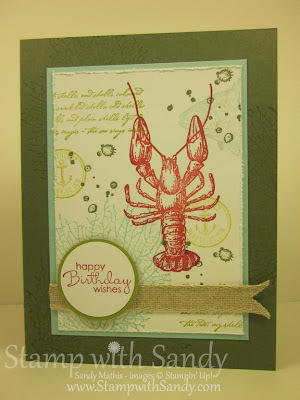 What a fun card, Sandy, love your sea scene in these colors! Thanks for sharing your card with us at the colourQ. 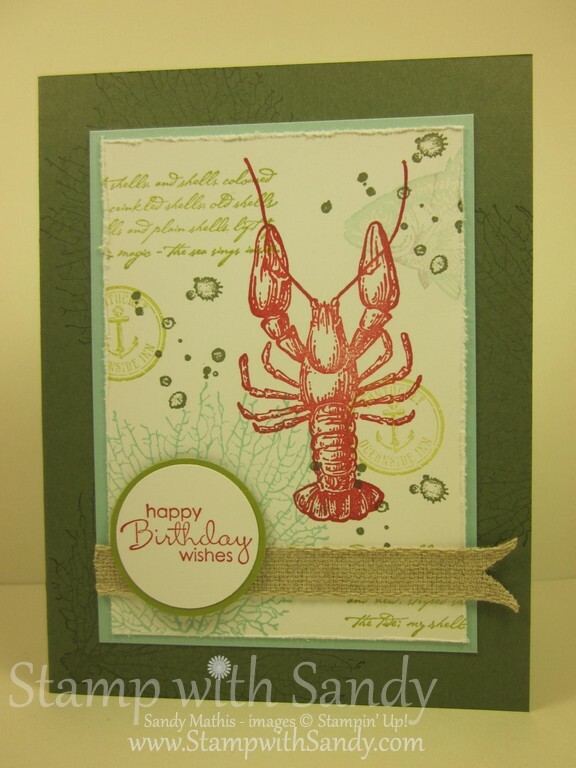 Wonderful use of colors for this cool card! Wonderful masculine card, I love your cooked lobster :).